Although often kept as a companion today, the Alaskan Malamute is a sled dog that originated in the cold northern lands of what is now Alaska. Although they pull sleds, this breed was never built for speed, but rather for its ability to pull heavy freight. During the summer months they worked as pack animals, and had secondary roles that included guarding caribou or assisting on hunts for large prey such as bear, moose or wolf. 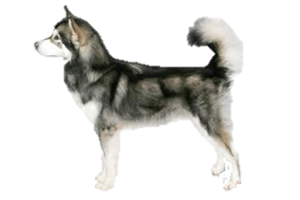 The name Malamute is derived from the name of the native Inuit tribe that originally kept them, the Mahlemut. They are one of the oldest breeds, their ancestors having crossed the land bridge with the first American's from Asia. For hundreds of years the Mahlemut treated their dogs as equals and shared their dwellings with them. As a nomadic people they were ever on the move, requiring them to have dogs that were capable of transporting their belongings from one camp to the next. These dogs were independent, thinking and acting for the well being of their team in the unpredictable arctic, even if this meant overriding the sled driver's command. Selectively bred, only the strongest dogs were kept and their numbers remained low and guarded by their people. In the 1890s a change swept throughout this region that threatened the breed as the sport of sled racing became popular and mushers began searching for faster dogs. First dogs such as the Siberian Husky were introduced and then cross breeding began with the only goal being the fastest time. Crosses ran rampant and the tribesman were unable to protect their dogs from the outside interferences. Fortunately, in the most remote areas undiluted dogs remained and in the 1920s canine enthusiasts Eva and Milton Seely spent 18 months searching for pure strains to begin rebuilding the breed. These dogs were taken back to their kennels and succeeded in saving the Alaskan Malamute for the future. Is the Alaskan Malamute Right for You?